This documentary is an absolute classic episode of this series, as it is entirely devoted to a popular and exciting topic - the history of the exploration of extra-solar planets which orbit stars outside of our solar system. The episode dives deep into the topic, giving us lots of detail about many planets discovered, and how such discoveries were made under challenging and sometimes disheartening circumstances. This is easily astronomer Geoff Marcy's episode more than anyone else's, as he gets loads of screentime (deservedly so) and gives us the up and down story of his career with long-time collaborator Paul Butler. Two thumbs way up on this episode - easily one of my most cherished favourites from "The Universe" series. Geoff Marcy: "It's embarrassing, frankly, when you think about how we humans imagined planets would orbit other stars, how common they would be, what properties they would have... Guess what? 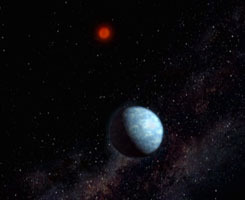 We imagined that those planets would look just like the planets that orbit our sun. Extraordinarily nearsighted in retrospect, and for a scientist, I find it embarrassing that I was a party to this. But in fact, what we've learned is that planets around other stars are remarkably different from the representatives we have around our sun." Just a decade ago, not a single planet was known to exist beyond our solar system. Astronomers have since discovered over 200 of these alien worlds - planets with such fierce conditions they seem inhabitable. But have planet hunters finally found proof of other Earth-like worlds? As this program was made, the year was 2007, and the exoplanet count was just over 200. ● As of the first 300 exoplanets discovered by 2009, he and colleague Paul Butler had been credited with finding more extra-solar planets than anyone else. ● leads a team that has found over 600 supernovae in one decade through automated intergalactic scanning. Read the data capsule review for another episode: "The Milky Way"
Episode Guide Catalogue for "The Universe".